A fall can be a traumatic experience for anyone but is especially dangerous for an older person. That’s why the statistics on falls are concerning: one in four seniors fall each year, and one out of five of those falls results in a severe injury. While the chance of falling increases as we age due to balance problems, less agility or another issue, this does not have to be a regular part of aging. There are simple, quick exercises you can start doing now to keep yourself strong and physically capable. What causes falls in seniors? 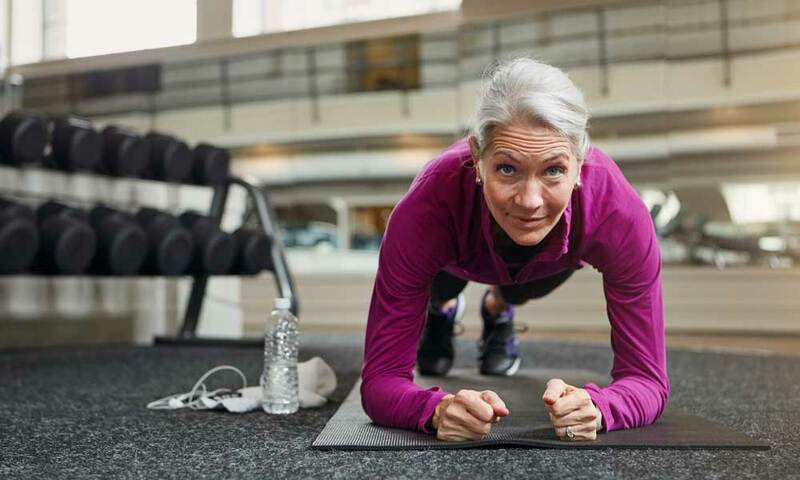 Weakness in the muscles: Also called sarcopenia (something one in three adults over 60 suffer from), a decrease in muscle density as a person ages can lead to balance issues as well as mobility issues. Medications combined with medical conditions: Some medical conditions can be exacerbated by medications, most commonly causing dizziness, vertigo, and drowsiness. Vision: A person’s vision can drastically change with aging, and it’s entirely possible for a senior to be wearing the wrong strength of glasses. Hazards around the house: One of the most significant issues that can cause a fall has nothing to do with age – trip hazards around the home like rugs, slippery surfaces, pets, toys, and electrical cords. Some of these issues are quick fixes, like picking up a throw rug or taping down a power cord. However, taking care of a few simple problems can lead people to feel like they’re doing everything possible to prevent a fall while they are ignoring one of the most effective aspects of fall prevention – physical fitness. Research published in the American College of Sports Medicine’s Health and Fitness Journal concluded that exercise alone is indeed effective in reducing falls among older adults. Here’s a look at eight different exercises recommended just for seniors. By helping with a combination of strength, dexterity, flexibility, and balance, these exercises can significantly lessen the chance of a senior having a fall. Some of these exercises are designed with a set number of repetitions that never changes, and others increase reps over time. Something as simple as standing on one leg can make a drastic change in your stability. To do this exercise, stand with your feet about shoulder-width apart. It’s okay to hold on to a chair or brace against the wall for stability. Lift one foot a few inches off the ground while holding your back straight. Hold for 15 seconds and then slowly lower it. Alternate to the opposite leg, and then repeat the exercise four more times (for a total of five) on each foot. This exercise replicates an activity where seniors quite often fall – standing up from a chair. To perform this exercise, start by sitting in a chair (preferably a hard one that’s easy to get up from instead of a padded one you sink in to). Push up on the sides of the chair using as much of your arm strength as you can. Over time, you want to get to the point where you can push out of a chair using almost no help from your legs and lower body. Once you’ve stood up, slowly sit down again. Repeat this nine more times for a total of 10 repetitions. Stand on one side of a chair, holding a small weight or water bottle in your opposite hand. Keeping a straight back the whole time, bend forward until your free hand is on the chair. Bend your opposite arm (the one with the weight) until your elbow is at your waist and push your upper forearm behind you. Slowly bring your arm back to your waist and then do nine more repetitions for a total of 10. Switch to the other side and do 10 more. Once this exercise becomes easy, slowly increase your weight, maxing out at five pounds. Stand straight up with your feet together. Slowly bend your upper body down until your fingers reach your toes using a “rolling” motion that begins with your lower back and goes to your neck. If you’re not flexible enough to fully reach your toes or to stand back up once you’re down, that’s okay. Don’t press yourself. Do as much as you can and keep your legs straight the whole time. Slowly roll back to standing and do nine more. Start by sitting in a firm chair with a seat that is high enough that your feet are flat on the ground. While holding on to the bottom of the chair with both hands for support, extend one leg straight out slowly. Once it’s straight out, bend your knee inward towards your chest as much as you comfortably can (keeping your upper body still). Switch to the opposite leg and do four more reps. Over time, you’ll want to work up to 10 reps, striving to get to a point where you can push both of your legs out simultaneously. This exercise may seem a bit advanced for a senior-specific exercise, but it’s an important activity. Lunges build strength in your core, which is where your balance originates. A strong midsection also gives you the ability to recover if you start to lose your balance. To do a lunge, stand with your feet just a little wider than shoulder length apart. Like other exercises, it’s okay (even recommended) to hold on to a chair for balance in the beginning. With your back held straight the whole time, slowly take one step forward until your back knee is nearly touching the ground. Don’t bend your front knee past your toes. At this point, slowly push with your front foot until standing again. Switch to the opposite leg and do the exercise four more times for a total of five. It’s essential to increase your reps over time until you can do 10 on each leg. When this becomes comfortable, add one or two-pound hand weights or ankle weights and start the exercises over with a lower number of repetitions. Marching in place is a standard part of a rehabilitation program for seniors who have been hospitalized. Lift one knee as high as you can, slowly lower it, and then switch to your other leg. Do 20 repetitions total. While this may not sound like exercise at all, strengthening your non-dominant hand is very helpful because it causes new connections in your brain and strengthens limbs you do not usually use. Start doing everyday tasks like eating or brushing your teeth using your non-dominant hand at least twice a week or more to benefit from this exercise. While just being active is a large part of being healthy as you age, use the exercises on this list to specifically help yourself to avoid falls. There’s no way to stop falls completely, but by taking some specific steps, you will lower your chances.